Today is a rainy Tuesday and I am reminiscing of our weekend of camping at Assateague State Park a few days ago. 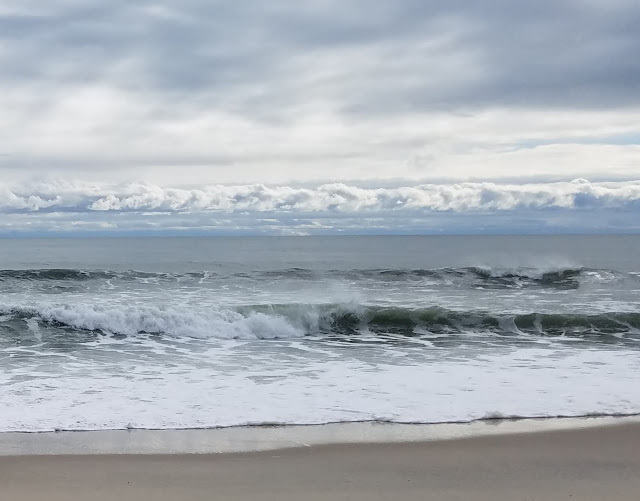 Who doesn't love the ocean in the fall? What? Camping in late October? It must have been freezing! Well, yes and no. Our family loves the beach in the fall more than the hot summer months and we thought October would be an ideal time to miss the inevitable flies and mosquitoes. So we booked our camp sites and sent out the invites months ago. 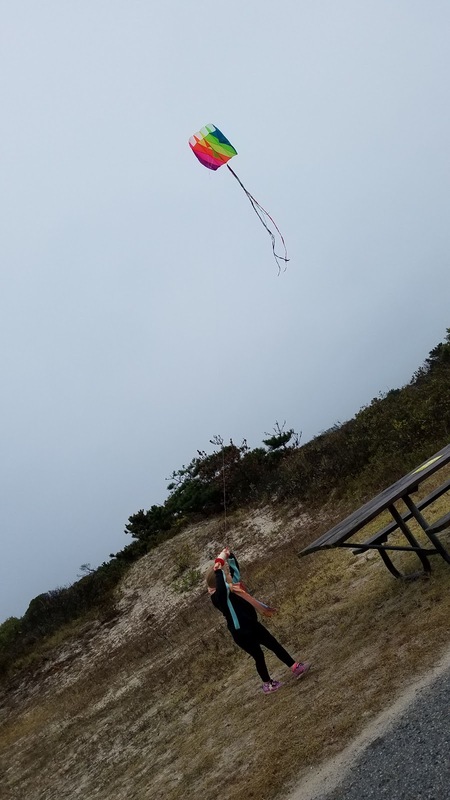 Our granddaughter flying a kite in the steady ocean breeze. All through the summer we dreamed about and looked forward to an idyllic family get together on the sand with roaring fires, good food and spectacular sunsets. I always tell myself that half of the fun of traveling is in the anticipation of the event. 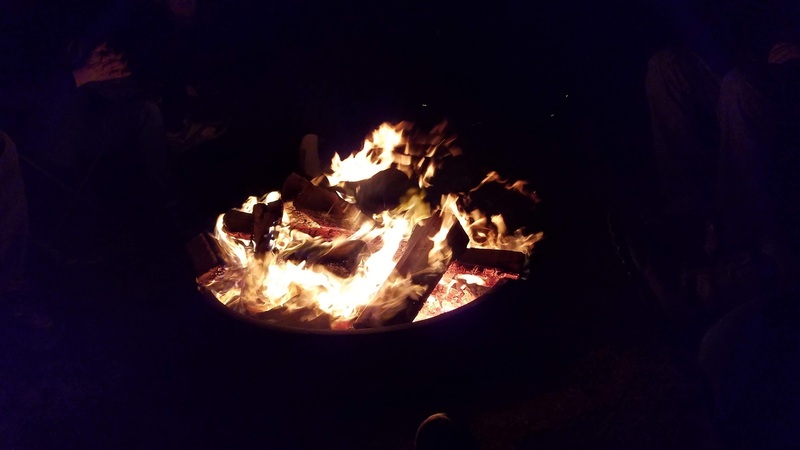 Night camp fires are so welcoming. So about two weeks previous, we started hearing about a coastal storm - a possible Nor-easter that might affect the camp grounds and therefore our trip. Daily weather checks confirmed the gloomy news. After much consideration, we decided to go ahead with our plans, weather notwithstanding. We headed for the ocean on Friday afternoon. The skies were overcast, but no rain and just a light breeze under a temperature of about fifty-five degrees. Wild ponies wandered around the campsites much to our curiosity. I won't bore you with too much detail so to summarize, everyone made it to the campsite by nightfall and then the rain started. 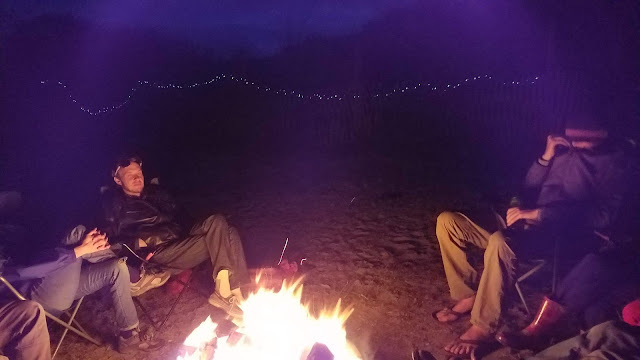 The wind was our biggest struggle as we tried to huddle around a fire together under a tent canopy but we ignored the gusts of wind driving the rain and smoky air into our faces. By nine o-clock, Eric and I turned in to collect a few hours of sleep before the storm might interrupt our sleep during the night. Sure enough, by midnight, our tent ropes were taking a lashing as the fabrics pushed and pulled in the gale force winds. The roar of the ocean was like a freight train that never stopped. 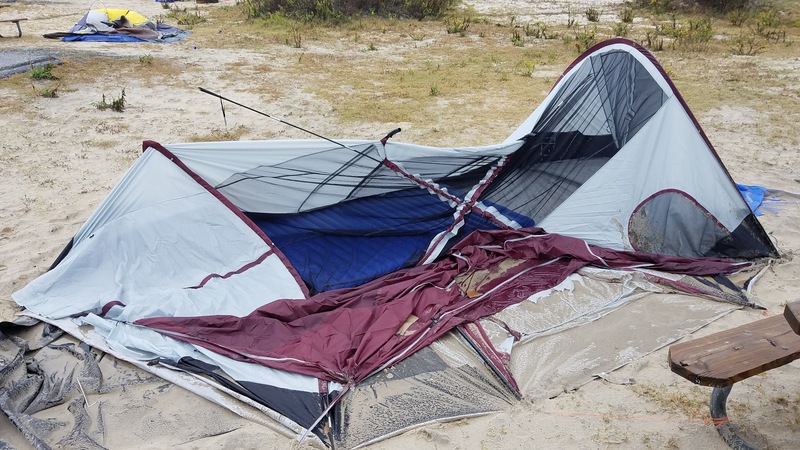 When our tent poles collapsed, Eric crawled out to check on the others and found our daughter's tent collapsed and empty, our oldest son's tent empty and sopping wet inside. Our second son was sleeping fine as he had wisely chosen a spot in the dunes sheltered from the wind. My brother's tent was twisting and shaking like it was possessed but holding strong. 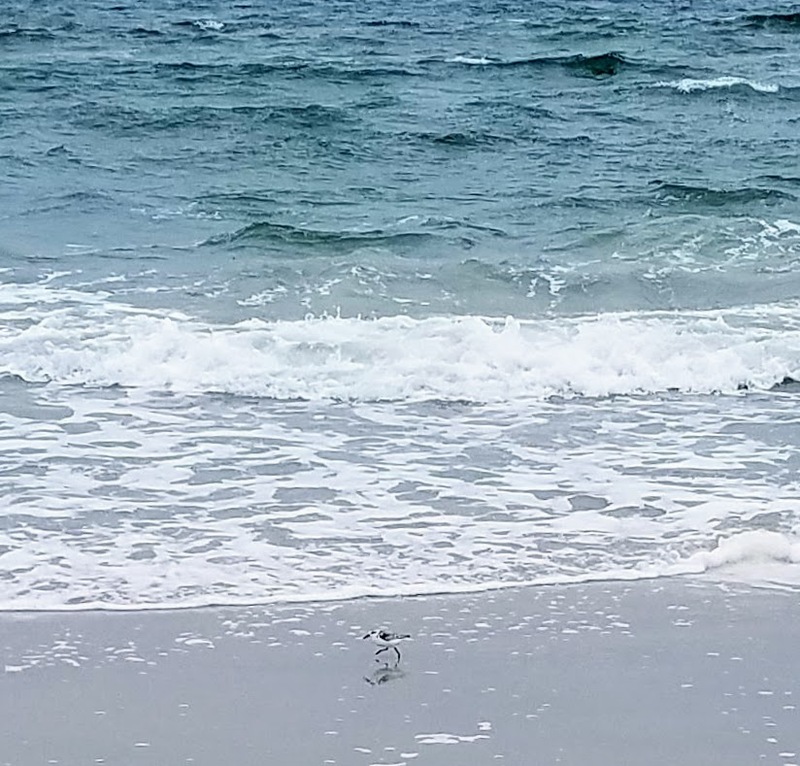 The ocean was wild and beautiful! We checked our cell phones and found our daughter and her husband had wisely escaped with their year-old baby to a local hotel. We found our oldest son and his four-year old daughter sleeping in our van when we decided to leave our tent. The local hotel was a welcome respite at three a.m. where we managed to get in several more hours of sleep, although I did catch the hotel manager laughing at our windblown and sooty bodies as we quickly escaped to our rooms. What an adventure! We drove back to the campgrounds and found that one tent was totally destroyed. The others we moved to a more sheltered area and spent most of the morning staking them well. We stoked up the fire and proceeded to have a blast cooking various chilies and laughing and visiting in spite of the light drizzle. 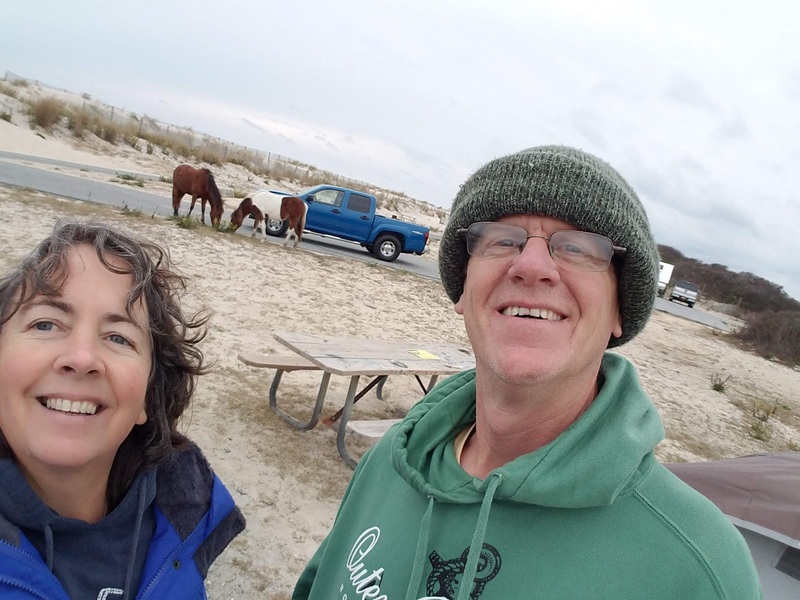 The campsite was a beautiful spot right behind the dunes along the Assateague Island coastline. 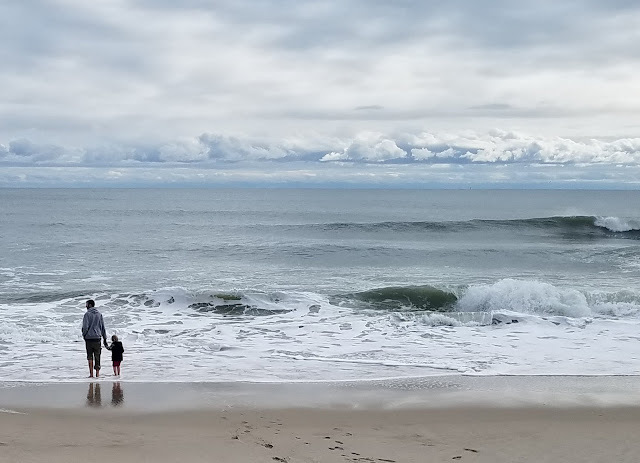 We were surprised and grateful when we saw the storm surge had brought the waves just to the crest of the main dune and not over, or we would have been flooded out. The water temperatures were not that cold. The second night was much calmer as the winds had died down to just ten mph or so. We found the wild ponies interesting camping partners as they did make crazy noises almost like children screaming in the night, but they didn't bother us. We had the usual conundrum of the air mattress not holding air and had to switch tents in the middle of the night, but the hot showers in the morning revived our spirits and warmed our bones. Windy camp fire but such fun! The camping season was over but we managed to have quite the adventure in spite of or maybe because of the "bad" weather. We spent the good part of three days together pushing our comforts away to enjoy the wildness of the ocean with our family and came away very tired but exhilarated. Eric worked hard to clean up our gear of all the sand and now we have to find a new adventure to plan for next year. Maybe a mountaintop somewhere...?